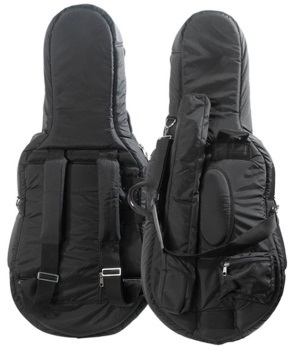 The soft, generously padded cello bags have been very popular for years and remain one of the best selling soft cello bags today.The B1010 soft cello bag is style with plenty of choices to satisfy everyone. Fully padded with 1" foam, with lots of usable pockets, and covered in a nylon canvas cloth exterior, the family of B1010 cello bags offers an alternative to the larger hard cases in providing protection and lots of easy movement under normal use conditions. Great for rentals, players of all levels, weekend gigs, and short trips.